MC-223-A Keychain Alarms (with 3mm LED Flashlight). Extremely loud 120 Decibel alarm is activated by removing the metal pin with attached rip cord. This multi-function alarm can be configured for most uses with included attachments. Note: MC-223-A (2009) has a larger key ring and smaller (3mm LED) flashlight than newer models. Use your personal alarm as a flashlight without activating the alarm. Built-in security light provides additional safety by allowing quick entry to your home or vehicle. 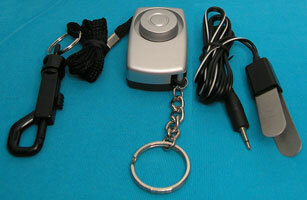 Convertible for use as Door Alarm or Window Alarm with included switch cord tweezers. With two connection points, key chain, clip, wrist strap and tweezers ... you can rearrange your alarm to suit almost any purpose. See how to use ALARM INSTRUCTIONS page. 1. Personal Protection - Attach to keys with built in key-ring. Ideal for people at risk entering or leaving their automobiles or homes. Use the fixed connector for your keychain so the alarm and your keys stay with you in an emergency. 2. Wireless Alarm - Insert included tweezers into door or window to detect an intruder. When contacts separate, the door alarm will sound. Protects hotel rooms, dorm rooms and balcony doors. 3. Property Guard - Attach to computer, purse, luggage or backpack using the included snap buckle or O-ring. Wrist strap is attached to pull pin. Be sure to connect items to the fixed connector so the alarm stays with your property if snatched or taken.